The 2014 baseball season is coming to a close. For the Storm, it’s been a roller coaster since day one, when the team reported for their first work out in late August. The start of a new season represents new goals, expectations and hopes but for some, the start of the new season might mean the start of their last collegiate season. 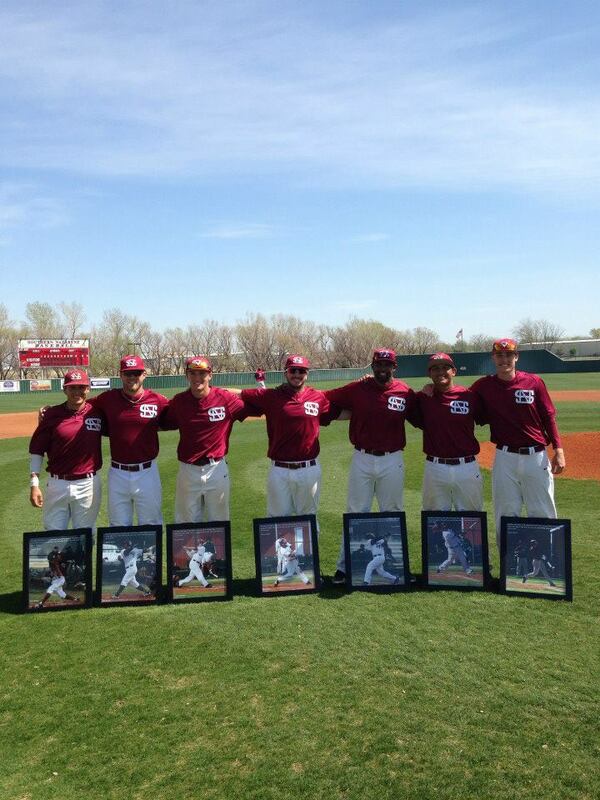 I’m talking about the Baseball Senior class of 2014. This year’s class was composed of seven seniors. In no particular order, those seven seniors are: Damian Santamaria, Scott Stanley, Luis Hernandez, Chance San Miguel, Austin Samulowitz, Ryan Brosnan and Ryan MacIntosh. Damian Santamaria is a native from Temple City, California and a graduate from Arcadia High school. Scott Stanley, from San Diego, California, was a graduate from Canyon Crest Academy. Luis Hernandez is from Santo Domingo, Dominican Republic and a graduate from Liceo Union. Chance San Miguel was born in Guam and graduated from Hilltop High School in Chula Vista, California. Austin Samulowitz was born in Alaska and received his high school diploma from Ben Eilson High. Ryan Brosnan is from Santee, California and graduated from Santana High School. Last but not least, Ryan MacIntosh was born in Tuttle, Oklahoma and graduated from Tuttle High School. All seven seniors were recognized before their 9 inning game on Saturday, April 12th where parents, friends and family were present. All seven seniors walked down the third baseline accompanied by their family members. Then, they were received by their coaches at home plate, where they hugged, shook hands and received a portrait of themselves. Players finished their recognition by hugging their teammates. SGA gave out free hot dogs and burgers to all SNU supporters as a part of senior weekend. The Storm took on the Arkansas-Monticello on a Great American Conference match up. While the Storm took the weekend to recognize their seven seniors, the Weevils had plans of ruining the weekend for SNU. The Weevils scored 31 runs on 31 hits and swept the Crimson Storm in the 3-game series.